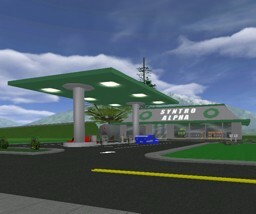 Syntro Alpha is the most common type of gas station and one of the most recognizable SynCorp franchises as it has many locations throughout SW City. The Syntax Estates precinct holds the record for most Syntro Alpha locations. 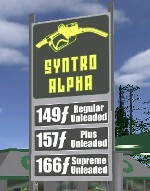 The business currently deals three types of fuels to customers: Regular Unleaded, Plus Unleaded and Supreme Unleaded. The origin manufacturing company of the petroleum products has been kept secret from the public by SynCorp for undisclosed reasons. Many business analysts assume SynCorp has a deal with Praxten? and that the business deal has been kept secret to avoid conflict between it and CommieCorp. The convenience store inside a Syntro Alpha station serves products such as CyberCola, Tastey Fries, Commie Puffs?, MadCorp Particle Cannon Kits, Ab1 Products and various cereals among other things. SynCorp founded Syntro Alpha as competition to Goober Gas? in 2005 and quickly overtook their spot as the number one gas station in the city. Due to the high amount of funding and advertising done by Syntro Alpha, Goober Gas was unable to keep up. Syntro Alpha continues to succeed as a franchise as new locations are popping up almost monthly. There are plans to extend service into the sale, servicing and replenishing of fuel cell's, since this is the next step forward after fossil fuels. Currently in SW City, Syntro Alpha stations are only located on SW Island and Hyokia Island. There are plans to extend service to places such as Sybit Island and Velothi Island, the next most populated islands in SW City. Stations have also been established elsewhere in Alphaworld away from SW City territory.